"It's as real as the feelings you feel." The Princes Bride opens on a young boy, enjoying a sick day at home. In order to keep his grandson entertained, Grandpa begins reading from an old book, The Princess Bride by S. Morgenstern. The story introduces Buttercup, a beautiful young woman and farmhand Westley. Buttercup is demanding when it comes to Westley, only referring to him as “Farm Boy.” Westley always replies with a simple, “As you wish.” Buttercup realizes that Westley loves her, and the two join in a passionate embrace. Westley leaves the farm to earn his fortune, but news returns that he has been captured and killed by the infamous Dread Pirate Roberts. Buttercup is devastated and swears to never love again. Later, it is revealed that Buttercup has agreed to marry Humperdinck, an arrogant and charismatic prince. Mysteriously, Buttercup is kidnapped by three men before her wedding. Her kidnappers, Spanish fencer Inigo Montoya, Hungarian giant Fezzik, and Sicilian Vizzini, plan to kill Buttercup and frame an enemy country for the murder. Vizzini explains that war will result, and the three stand to make money. The three soon realize that they are being pursued, and individually they attempt to battle with their pursuer, the Man in Black. After the defeat, the Man in Black is revealed to be Westley, and again the two lovers briefly reunite before Prince Humperdinck finds them. Buttercup agrees to return to her arranged marriage if they allow Westley to go freely. The Prince lies, and as soon as Buttercup has left, Westley is captured and taken to be tortured, where he eventually succumbs to death. On the eve of Buttercup’s wedding, Fezzik and Inigo rescue Westley, and taken him to a miracle worker who manages to revive him because Westley was only “mostly dead.” The three are able to apprehend Prince Humperdinck and rescue Buttercup from the unwarranted marriage. The four ride off together, and Grandpa ends the story on Westley and Buttercup’s last kiss. The Princess Bride is currently available to watch and stream, buy on demand at Amazon, Vudu, Google Play, FandangoNow, iTunes, YouTube VOD online. 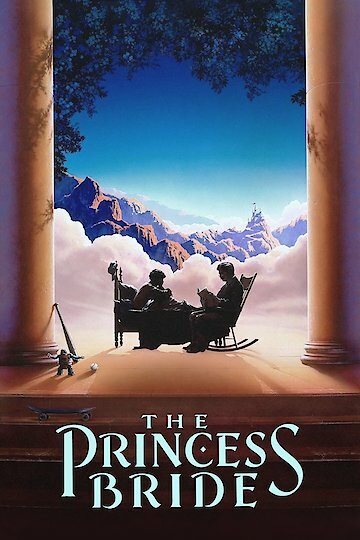 It may seem inconceivable that 'The Princess Bride' is 30 years old, but it is. And in honor of its birthday, the classic comedy is returning to theaters. 5 Chick Flicks for Guys! With Valentine's Day around the corner, the gentlemen readers out there might want to turn to Yidio for some date night advice. Well, lucky for you we've compiled a (sadly short) list of "chick flicks" that will not only woo your girl, but also not make you want to vomit. Netflix has not been the place to go to watch popular theatrical movies of late, but in April, the service will offer a list of new content that includes quite a few films worth watching.